For use on both Odyssey and other sealed lead acid batteries. Approved and recommended by EnerSys, the SX100-1 and SX150-1 are high quality microprocessor controlled battery chargers designed with efficient and reliable switching technology for recharging Sealed Lead Acid (SLA) batteries. Runs clean & silent without moving parts-no noisy and unreliable fan required. Since the inception of Xenotronix, we've operated under a simple premise: build innovative high quality battery chargers and back them with outstanding service. It's a simple philosophy that has enabled us to become a leader in our field. 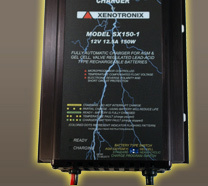 Xenotronix standard products include a complete line of high quality off-the-shelf chargers for Sealed Lead-Acid, Nickel Cadmium and Nickel Metal Hydride batteries. In addition to our standard line, we take great pride in our state-of-the-art Engineering Department and Lab. By utilizing the latest equipment and software our engineers can guide you through the process of selecting the innovative solution to meet your every need.